Many have tried, few have come close, none have succeeded. To capsize the Crusaders will one day require 48 minutes of complete, full-fledged complementary football, a well-balanced act with all three phases of the game click in unison. That day and that game is not now, not this year. 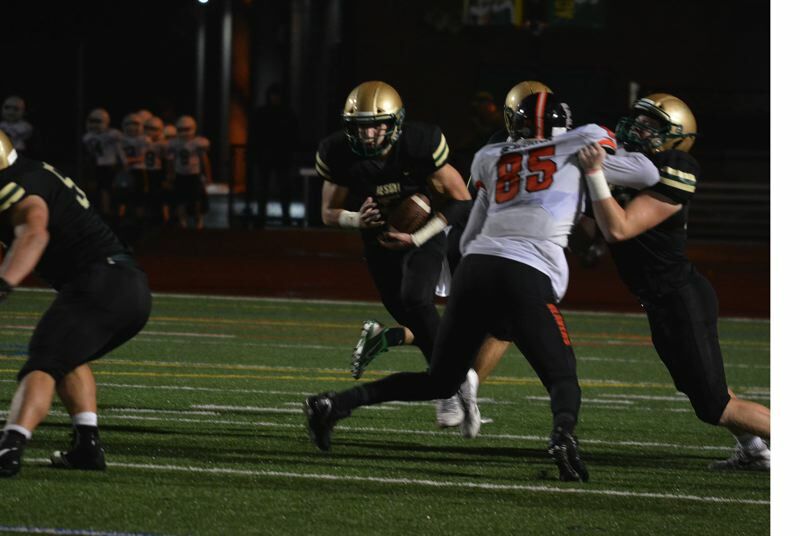 Jesuit made sure its extended undefeated Metro streak stayed in intact, blitzing Beaverton with 55 unanswered points in its regular season finale on Friday at Cronin Field in a 62-14 runaway win. Better yet, the Crusaders clinched the No. 2 seed in the Class 6A power rankings, meaning they'll have homefield advantage through the quarterfinals, proved Jesuit makes it that far, of course. The way Jesuit is playing, beating the likes of Central Catholic and Sheldon mixed in with its Metro superiority, it wouldn't come as a shock if the Crusaders are playing deep in November with a great shot at the 6A state title. "Earlier in the year, I said whoever was playing best by Week Nine is going to have the best chance in the playoffs and I think we're playing really well right now," Jesuit senior quarterback Will Spitznagel said. "We definitely feel confident going into the playoffs. I feel like we've put ourselves in the best spot that we could've. 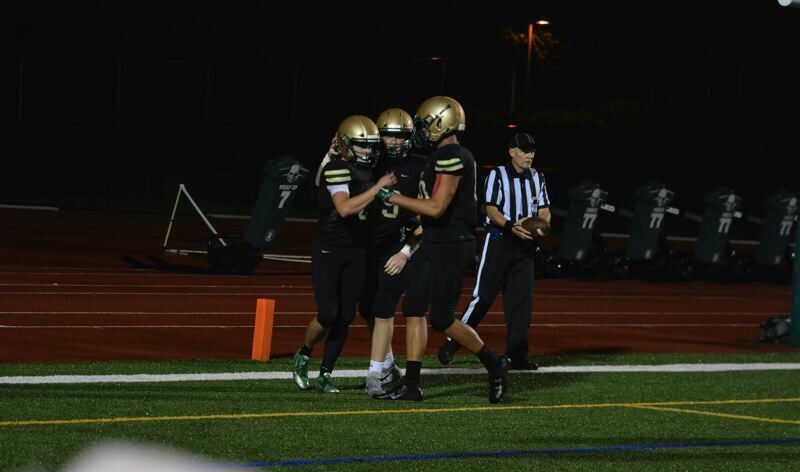 Coming off that Week Two loss to Lake Oswego, I think we've improved every week and that shows out on the field. We all love each other and have each other's backs. If we just keep on doing that, I think we're in a great spot to play the best teams and play the best football that we can." The licking was Jesuit's 39th straight league win over the last six seasons. Jesuit is the standard bearer of the Metro League. That hasn't changed since 2012. It might not alter for the foreseeable future. Rarely have they been tested, never have they been beaten in Metro play over the last six years, a remarkable feat considering the conference is still thought of as one of the top two or three in the Class 6A state classification. The Beavers, to their credit, gave the Crusaders a run for the first quarter and a half, leading 14-7 with 7:52 to go in the second quarter after a pair of takeaways and two Carson Budke touchdown passes. Budke linked up with Trent Walker and Parker McKenna for the scores while Sandrey Mitberg sacked Spitznagel twice and Hunter Franklin fell on a fumble for the Beaver defense. Morale on the Beavers' behalf was at a season-long high as the sideline was rowdy, the players were locked in and centered on a possible seismic upset. From that point on, however, Jesuit was utterly dominant. Spitznagel and the Crusader offense engineered two second-quarter touchdown scoring drives including a 10-play, 85-yard march with less than 90 seconds to go in the half that the senior signal-caller punctuated with a six-yard scamper following a pair of pulverizing clear out blocks by Joe Quillin and Logan Horton. The latter score gave Jesuit a 21-14 halftime lead. "We come into every game knowing it's a four-quarter game, not two," Spitznagel said. "We don't really care what the score is at halftime. We're going to play four hard quarters and give it our all. We have a lot of heart on our team, a lot of tough guys and we're gonna bring it out every single Friday night." The drive Spitznagel and the Crusader offense put together going into the half was the game-changer. Spitznagel was huge on the march, rushing for 27 yards and throwing for another 56 including a key 11-yard pass to Joey Gatto on 3 and 4 and a subsequent laser shot through the Beaver secondary that hit Josh Daul in stride and allowed the slippery wide receiver to roll down to the Beaver 6-yard line for a chunk 23-yard gain. On the very next play, the senior field general ran a quarterback keeper and cut inside a crushing Horton lead block for the 6-yard touchdown run. "We found a good mix between the run and the passing game," Spitznagel said. "I thought that really clicked. We found a good scheme and stuck to it. They couldn't really stop us from there. Our defense really stepped up when we needed them and helped us out a lot. The offense line was great. I thought we played really well as a team." It was the sort of drive that showed Spitznagel's progression, from caretaker as a sophomore to stakeholder as a junior to difference maker as senior who can take a team on his shoulders and get it done with his legs and his right arm. Jesuit's bread and butter is its ground attack with Andy Alfieri heading a stable of athletic backs that are capable of carrying the load. But if Spitznagel and his pass catching weapons can keep up this pace and timely production, the Crusaders are deadly. "Most teams look at us as a one-way team running the ball," Spitznagel said. "But we can mix in some play action and some shotgun out of that. Teams don't really know that until they play us." 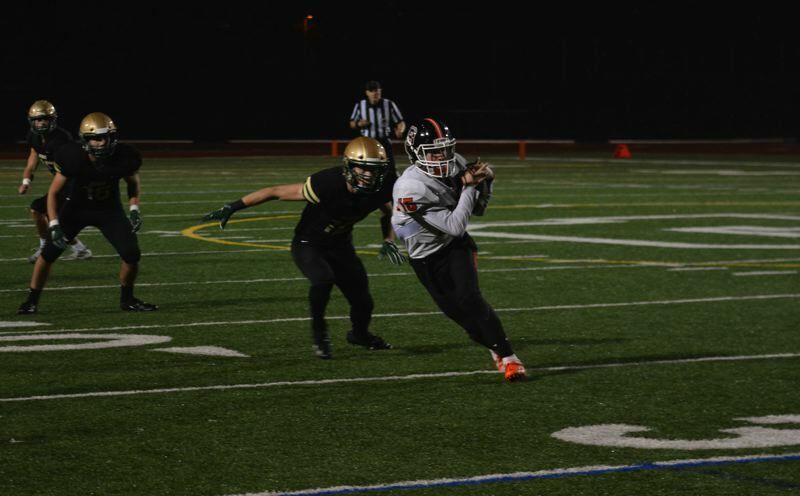 The Crusaders' third-quarter scoring clip and overall mastery conjured up memories of some the older Jesuit teams from '13 and '15 were some of the most talented teams in state lore. Sophomore cornerback Campbell Brandt had not one but two pick-sixes in a five-minute span, reading Budke's eyes, intercepting a pair of intended out routes and running them back to the house for scores. The Crusader defense allowed just one first down in the third. Teddy Atkinson ripped off two big runs and an 11-yard touchdown run. Daul took a Wildcat formation shotgun snap and powered his way for a 30-yard touchdown scamper of his own. "That third quarter showed how much depth we have and how many weapons we have in the backfield and on defense," Spitznagel said. "When we're faced with adversity and tough situations, I think we showed we can get over that hump." By the time the third quarter clock struck zeroes, Jesuit was up 49-14. Just 12 minutes earlier, Beaverton was within one score of the now six-time defending Metro champs. Then the game snowballed into a spiral that got away from the Beavers. "We took our foot off the pedal for some reason," Mitberg said. "I have no clue why it shifted. We were playing our hearts out, but I don't know. Jesuit is good, they're a solid team. But the score does not reflect the game at all." In the fourth Spitznagel hit Colin McMahon for their second touchdown connection of the game. Linebacker Zach Carr recovered a fumble that Jesuit turned into a Solomon Bandy 10-yard touchdown run. What was once a highly competitive contest turned into a running clock blowout. It was the sort of half Beaverton wants to let sit in its craw for a couple of days, but can't let linger into next week when the postseason begins. At No. 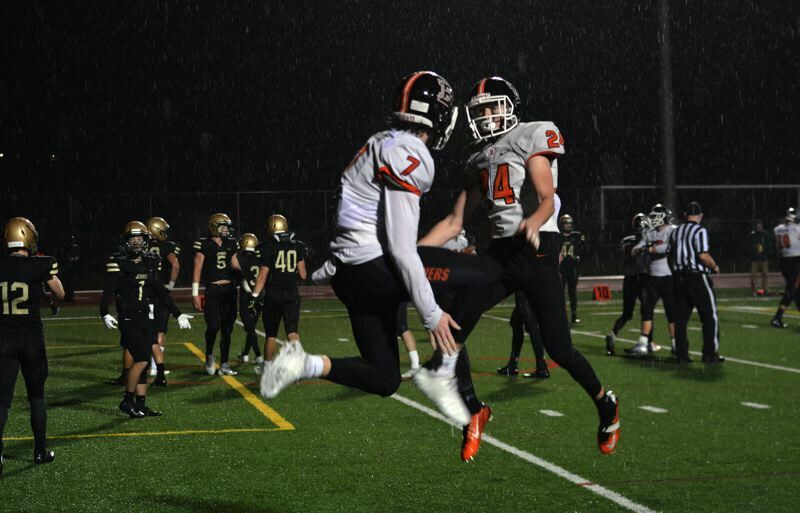 20 in the power rankings, Beaverton is looking a road playoff game with either Barlow or Oregon City next week. "What we did in the first half, we want to extend that throughout the game," Mitberg said. "If we do that, we're a top team in the state. I know we are. We've just never had that full drive. In the first half, we had (Jesuit). It's either we start cold and end hot or start hot and end cold. We have to fix that before the playoffs. We want to keep playing, keep going. I think we can make a run for it."